I've read nearly all of Geraldine Brooks' books -- and for the most part -- have loved them all. This one just didn't do anything for me. The consensus amongst our book group members was mixed as well -- the majority of them didn't finish the book -- or -- skipped various chapters and moved on to others. I read all but the last two chapters, because I felt like the author just continually repeated herself through out the book. From the discussion we had tonight, I don't think I missed anything substantial. Ms. Brooks experience in the Middle East is legendary. She spent many years covering the first Gulf War as a reporter for the Wall Street Journal. I don't doubt her expertise. My biggest complaint about this book was from the opening page, then author seemed to have an agenda against the Islamic faith. That she was out to prove that all Islamic women should abandon their religious garments, and in many ways, "burn their burqas" (much like burning your bra) in order to become feminists. Granted, in the forward from the publisher it reads, "Brooks' acute analysis of the world's fastest growing religion deftly illustrates how Islam's holiest texts have been misused to justify repression of women, and how male pride and power have warped the original message of a once liberating faith." But I was hoping for more balance in her writing and less "axe grinding." Also, as a Mormon, who is often reading about my religion from a non-members perspective, I kept wondering, "How much of this is correct?" Because when reporters or writers are writing about my faith, inevitably, they always have something wrong. Another issue I had, and this isn't the fault of the author, but the book seemed dated. This was published in 1994, long before 9/11, and our wars with Afghanistan and Iraq. Islam has become far more militant since these events, with the rise of the Taliban and Al Qaeda -- and her stories and analysis didn't measure up to current events. None of our book group members know anyone personally that is a Muslim. It would have been nice if we could have had a a guest speaker at our book group -- a Muslim woman who could explain where Ms. Brooks was on track, and where she wasn't. Unfortunately, we had to decipher those things on our own. But as is ALWAYS the case, the discussion was lively and I came away having learned so much from the book and my fellow groupies. 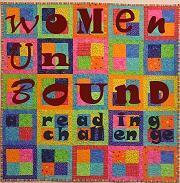 This book was one of my original selections for the Women Unbound Challenge. Yeouch. Maybe I'll skip this one. I didn't realize it was published so long ago. All that's happened in the last 9 years really puts a different perspective on literature about this region. You make good points about the book - I also thought it was dated. I did enjoy it and felt it expanded my knowledge of Islam and women in Muslim countries but I see your point about it being written from one perspective!